Another shoulder bag sold to Denmark a couple of months ago. 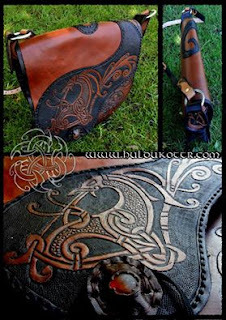 It wasn't a custom work as such, but it was done before our online shop, that means that we can use this own designed Ringerike Norse beast again for another item...maybe a belt bag for reenactors or whatever comes to mind. Time will tell!